On three of the six nights, study team members also hunted for radio signals in the vicinity of KIC 8462852 using the Allen Telescope Array (ATA) in northern California. This joint ATA-Boquete work was a test of SETI coordination, Vakoch explained. "If some day we really detect a signal from an extraterrestrial civilization, we need to be ready to follow up at observatories around the world, as quickly as possible," he said in the same statement. The ATA, a system of 42 radio dishes, also detected nothing of note. "The hypothesis of an alien megastructure around KIC 8462852 is rapidly crumbling apart," Vakoch said. The new study, which was led by Marlin Schuetz of SETI International and the Boquete Optical SETI Observatory, has been submitted to The Astrophysical Journal Letters. You can read it for free at the online preprint site arXiv.org. The leading explanation for KIC 8462852's bizarre brightness dips may be a family of comets on a long, elliptical orbit around KIC 8462852. 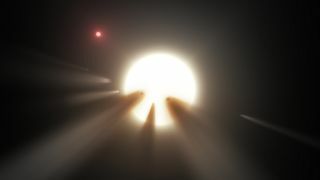 These comets, or comet fragments, may have blocked KIC 8462852's light in 2011 and 2013, while Kepler was viewing the system, then zoomed off into deep space, a separate research team suggested in a recent study. Kepler's observations of KIC 8462852 ended in 2013, when the observatory lost the second of its four orientation-maintaining reaction wheels. This failure ended the prolific planet-hunting telescope's original mission and led to the formulation of a new mission called K2, during which Kepler searches for exoplanets on a more limited basis but also observes other cosmic objects and phenomena.